Ever since seeing BBC's "Wartime Farm" series, I've been fascinated with the idea of a "pig club" that many rural folks in Britain participated in during WWII. The concept is this: a group of people in a community were given permission to raise a pig, feeding it from their collective food scraps. Then come slaughter time the government claimed a portion of the meat and those in the pig club could divide the rest amongst themselves. Pig clubs were a great way for several families to benefit from raising a pig together - the responsibility was shared and the meat was shared as well. As far as I'm aware, no rationing was involved for this program. The government did take its share, but still. 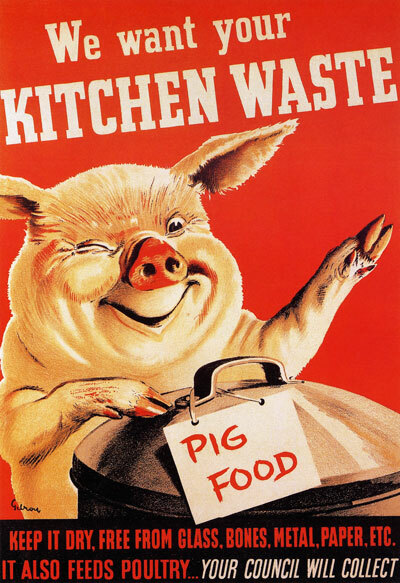 It was yet another great idea the Brits had for conserving resources, but also making a way for families to have a little extra meat that didn't have to cycle through the rationing system. Of course, this gets my modern sensibilities working... Many people have heard of a "cow share". This usually just means you split up a cow with a bunch of other people to stock up the beef as food storage in the freezer and to also get a better price per pound. The farmer does all the work though. This week I chose another British recipe, this time using pork sausage. And once again it was chosen purely on the name. Isn't Pigs In Clover the greatest name ever? As the recipe advertises, it is a very "wholesome" and economical dish. It calls for 6 sausages, cabbage, and 6 potatoes. That's it. I almost couldn't believe it. What supper recipe only calls for three ingredients? Apparently, this one does! I used sweet Italian sausage, white potatoes (they were on sale! ), and a mixture of red cabbage and brussel sprouts which I had in my fridge and which were not aging very gracefully. It felt good to put the cabbages to use instead of wasting them. I don't currently have a pig to feed scraps to, but our chickens enjoyed the wilted cabbage leaves, though. Wash and scrub the potatoes until clean. Core the potatoes with an apple corer. Save the cores! I sprayed them with olive oil, sprinkled them with that garlic salt blend from Trader Joe's and baked them with the other potatoes. They tasted awesome - like really huge, round French fries. Split the sausage casings with a sharp knife. Peel off the casings leaving only the meat. Breaking off pieces of the sausage, stuff it into the potato holes, packing it in as you can until they are full. If you let them overflow like I did, the sausage ends get really dark and crispy, but I liked that. I thought they tasted good. Bake in a 400º oven for between 45 minutes to an hour until the potatoes test done with a fork. While the potatoes are baking, put the chopped cabbage in a lidded pot with some water (enough to not let it burn) and steam until soft. I seasoned mine with salt and pepper. Then put the cabbage in a dish and lay the finished pork potatoes on top and serve hot. My husband really loved this meal. I only ate the potato cores and some extra sausage since eating a whole potato will give me a headache, but I felt the meal was filling and nicely simple. Those Brits know how to eat without fanfare, that's for sure! It's a good reminder of how good the basics can be. Enjoy! Feel free to liven it up. Nice. I agree, bacon would help.